I would ask Bobby who was the horrible person who abused and dumped such a wonderful cat. And I would ask Ashi if, since she is so cross-eyed, does she she double?? I would ask Harry the Farm cat if he had any brothers or sisters. Answer to number 4 might be scent, he may have smelled a cat since their sense of smell is so keen but if I may indulge in a pun, the important thing is that he found you, it was his destiny.., the other questions are MOO-T at this time!! :-) Happy Tues PIMP and MOO!! My cat Grayball lived with my Dad since being a kitten, so I know her background, but she was an outside stray, so I would like to know her adventures...she was born in his yard. Now she is strictly indoors cat and loving it! M thinks I lived with someone too before ending up in the shelter. I love being around people and I don't act like I was mistreated at all. She'd love to know what it was like for me. I have the same questions about Leo - who showed up at my door when he was about a year old, but I don't think he did have a person before me. I had been seeing him around the area for about 6 months before he decided that my house was going to be his new home so I think he was born to a tame mom but wasn't really a owned cat before he struck out on his own. I would ask my kitties all of those questions! Especially, I would ask foster cat Shadow where he was before the shelter. He is the only one who would be able to tell me how he ended up there! I would ask Lenny how he ended up living on the street and what made him call out to my friend delivering Frito Lay chips that wet morning. One snowy day about 2 1/2 years ago, a teenaged kitten discovered the cat-flap on my friend's back window. He jumped through and the rest is history. I'm sure he just followed his nose to the smell of food. Now he rules the house and is the sweetest fur-boy you'd ever hope to meet. We think he was dumped, and we can't imagine who would do such a thing, but he lucked out big-time and so did my friend. i have lots of questions to ask my kitties, and i do ask them (monkey answers in his own way)...but what i REALLY WANT TO COMMENT ON IS: SMALLZ! he's so cute! and what a name! i love him. Where were you born & how did you end up in the shelter? Who was Aspen? (when I got him from the shelter his paperwork said to adopt Andre & Aspen together, they were inseparable but there was no Aspen there when I went). Were your feelings hurt & were u scared when you were adopted by someone & then returned to the shelter cuz they had allergies? Is that why you meow so loud when I put you in the carrier to visit the vet? Do you think I am going to take you back to the shelter? Do you get scared when I leave the house? I hear you crying sometimes when I'm outside & I know you are looking for me that's why I stick my head in the door to reassure you that I'm still here. Is there anything else I can do for you to make your life more complete? You do everything for me so I want to make sure I'm fulfilling all your wishes & dreams. I got Andre at 7 months but I wish I had seen him as a little, bitty baby. I know he was precious cuz he's just so darn cute now. 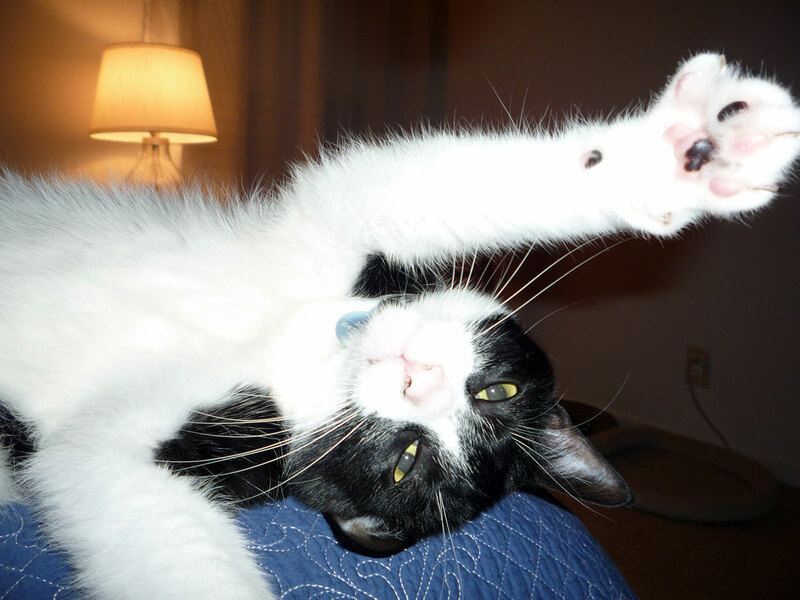 I would ask Figaro how he came to be at the shelter and what his life was like before. And I would ask Holly if I ruined her whole life by adopting Figaro. Those are some mighty good questions. I have two cats that I really wonder where they came from. One, Lucky, was even neutered. I think people abandon their cats for one reason or another. Most of the other cats here, I know where they came from. I have the same questions for Girl. She showed up at my back door scared and alone. She did not want to leave, but I kept putting her out when I went to work so she could go home. Two weeks later I gave up and let her stay. I often wonder being so timid and afraid how she came to be at my back door. One frigid (28 degrees) winter night many years ago, I heard a cat meowing outside my door. I opened the door, and a beautiful long-haired cat walked in. It was obvious that she was not a stray. She was not timid or afraid, and she led me directly into the kitchen, winding herself back and forth between my feet. Since I had no cats at that time, I had no cat food, so I opened a can of salmon and fed her. I also gave her some warm milk. After she ate, she jumped up into a chair and curled up to rest. Since I had two very excitable dogs, I knew that keeping her wasn't an option. Before daylight, I heard her scratching at the door frantically, trying to get out. I tried to dissuade her, but she was adamant.Although I think she had an instinct that whoever lived in this house would help her; I think she stopped to get warm and refreshed, and then headed for home. My Mommeh feels very lucky that she knows exactly where Harley came from, and even has a photo of him on the day he was borned! We're also lucky because Harley's feral mamacat actually came in to be spayed, but since she turned out to be full term, but vet decided to deliver the bebbehs! I have a black & white kitty, named Lucy, who was a stray before I met her at a shelter...she was called Moomoo! She has a rather cow-like appearance, but Lucy suits her better. She was 7 pounds when I adopted her but quickly began eating everything in sight and has doubled her weight! I also adopted a male cat from that shelter at the same time, and he's mostly black with some white, named Lionel. I do wonder what sorts of thoughts go through their heads, plus I believe they understand the english language but choose not to speak it! I would like to be able to get answers to these questions from my cats as well. I wish they could tell us about themselves - even if it were just a visual as we connected telepathically!!! I have all the same questions, of course, for my departed kitty Sally. But her path to me was complex and strange. She had been living in a feral colony centered around a dumpster behind a string of retail stores including restaurants. She was around 7- or 8-months-old. One day, she wanted to graduate to barn cat. She spotted a couple taking a walk from the pizza joint down the street to their home, and followed them. She followed at about 30 feet behind them. Despite her feral nature, they were able to catch her and put her back! Sally was so small, they were afraid she still needed her mother! But a couple of days later, that couple was taking the same walk, and Sally followed them again. This time, they let her do what she wanted. They got home, walked back to the barn, and showed Sally a neat place surrounded by hay bales that was warm, and they got her some food and water. She was very happy! This went on, but the people felt that Sally needed a better life. They captured her to take her to the vet for spay/parasites/vaccine etc, and put a notice up on a certain bulletin board explaining the situation. And that's how she came to live with me. She and I had a deal: she was still feral, but she would be my roommate as long as I DID NOT MESS WITH HER. She would give me the hairy eyeball if I got too close. She had certain health problems, so I had to drag her to the vet, but other than that, I just didn't do anything to upset her. After a few weeks, she decided she could come out to the living room and play with her toys while I was there. However, it took EIGHT MONTHS of living together before she would allow me to touch her voluntarily. And at that point, I realized we were bonded for life. So my question is, how did you know that the following weekend there would be a big old blizzard out at the dumpster? How did you know that those people had a barn, and how did you even think of deciding to go with them? Maybe you'll tell me, one day, when we meet at the bridge. RIP, Sally, my darlin' girl. We had a good time, didn't we? Almost all of these comments say one thing: How did the kitty choose my house (or me)? They mostly seemed very confident about their choice and knew what they wanted. I've come to believe that, just like hobos of yore, there are little signs at the back door saying "Nice lady lives here". But sometimes, their choice of person is almost adamant. They are serious about it - it's not random. And that's what I don't understand. So I would ask all of them: How do you choose?